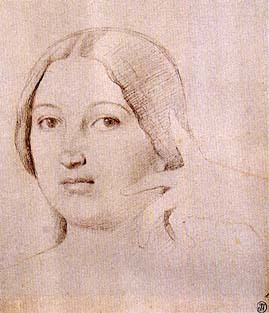 The leader of the classical school of French painting from the 1820s through the 1860s, Ingres was acclaimed for his exquisite draftsmanship and his penetrating insight into the human personality. In 1844 he was commissioned to execute a portrait of Madame Marie-Clotilde-Inès de Foucauld Moitessier, daughter of a government functionary, whose beauty the artist considered divine. This painting (now in the National Gallery, London), which troubled Ingres for many years, was completed only in 1856; it shows her seated in a majestic pose derived from a female figure in an ancient Roman fresco from Herculaneum, which Ingres had probably viewed in Naples as a young artist. In 1851, when this commission was still unfinished, he responded to his client's polite prodding with a portrait of her standing (in the National Gallery of Art, Washington, D.C.). Worcester's drawing- a study for the London painting- shows the head and hand in the same position as those in the Roman figure. The artist's superb handling of black and red chalks create firm contours, delicate tonal nuances, and subtle facial animation. Abbreviated though it is, the sketch suggests Ingres's idealization of form and the love of the antique that underlies his art.